What Is the Average Credit Card Interest Rate? 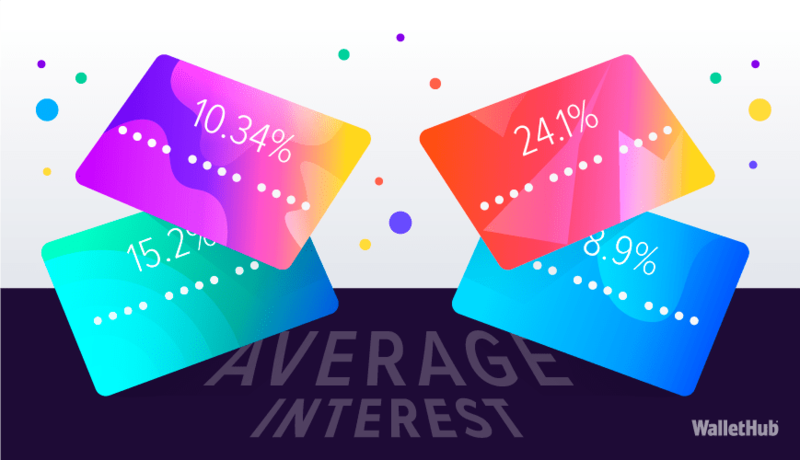 The average credit card interest rate is 19.24% for new offers and 14.14% for existing accounts, according to WalletHub’s Credit Card Landscape Report. Credit card interest rates have increased in recent years and will continue to rise as the Federal Reserve hikes its target rate. But much like there are many different types of credit cards, there are lots more average credit card APRs worth considering. The average secured credit card’s APR is 18.81%, for example, while credit cards for people with excellent credit charge 14.41%. Clearly, a lot depends on your credit standing. So before looking for a credit card with a low APR, make sure to check your latest credit score for free. That will help you determine what type of interest rate to expect. It’s also important to note that in this article we will use “interest rate” and “APR” interchangeably. APR, or Average Percentage Rate, is a more specific term that describes how much interest a balance will accrue over the course of a year. But interest is assessed daily, so a credit card’s interest rate is its APR divided by 365 (days in a year). If your APR is 15%, for example, you would be charged interest at a rate of 15%/365 per day. That is, if you have a balance you don’t pay in full by the due date. Below, you will find a complete breakdown of average credit card APRs by category, followed by a look at how they’ve changed over time and some tips for how you can get a lower rate. Averages reflect regular APRs. With the exception of the “All Existing Accounts” row, they pertain to new credit card offers. The main takeaway from this list is that the better your credit score is, the lower you can expect your credit card interest rate to be. And the vast majority of us have some room for credit improvement. You also get a sense for how average credit card interest rates fluctuate over time. Below, you can take an even closer look at how APRs for existing accounts and new offers have changed in recent years. The average rates discussed above are so-called regular APRs. They apply to purchases and balance transfers under normal circumstances. But there are several other kinds of interest rates you should be aware of. Purchase Intro APR: 0% for 10.59 months – Usually 0%, this promotional rate lasts for a limited amount of time before the regular APR kicks in. Balance Transfer Intro APR: 0% for 12.06 months – Usually 0% and sometimes offered for the same length of time as the purchase intro APR, this promo rate applies to balances transferred from another credit card or loan. Penalty APR: 26.18% – You’ll only see this interest rate if you fail to make your minimum payments. Cash Advance APR: 21.02% – You can use your credit card like a debit card to get money from an ATM. But interest will start accruing immediately, and you’ll be hit with a hefty fee. Improve your credit. A better credit score can lead to much lower interest rates as well as higher odds of approval for 0% credit cards. WalletHub’s personalized credit analysis will tell you exactly what you need to do. Comparison shop. It’s very easy to compare credit cards based on their regular and introductory interest rates, among other things. And if you know what your credit score is, you’ll have a sense of what rate you deserve. Take advantage of 0% offers. Applying for a 0% credit card before making a big purchase that will take you months to pay off can save you a bundle. The same is true of transferring a balance with a high rate to a 0% balance transfer credit card. You just have to make a plan for repaying what you owe by the end of the 0% period. A credit card calculator can help with that. Separate debt from everyday spending. Trying to use one credit card for everything isn’t the best idea. Don’t make purchases you can afford to pay in full by the due date with a credit card that you’re also using to carry a balance from month to month. That’s because those everyday purchases will accrue interest right along with your ongoing balance. But if you get another credit card solely for such everyday spending, interest won’t apply to it, as long as you pay your bill in full every month. In conclusion, average credit card interest rates are a good tool to use when considering your credit card options. But it’s important to remember that the best credit card APR is one you never need to worry about. And you can get such a worry-free rate by always paying your bill in full. If you do that, your card’s APR won’t be a factor and you can focus on minimizing fees as well as maximizing rewards when picking a card. If you’d like some even more in-depth statistical data about average credit card interest rates, WalletHub’s Credit Card Landscape Report has everything you’re looking for.